Höststädning – what is it? 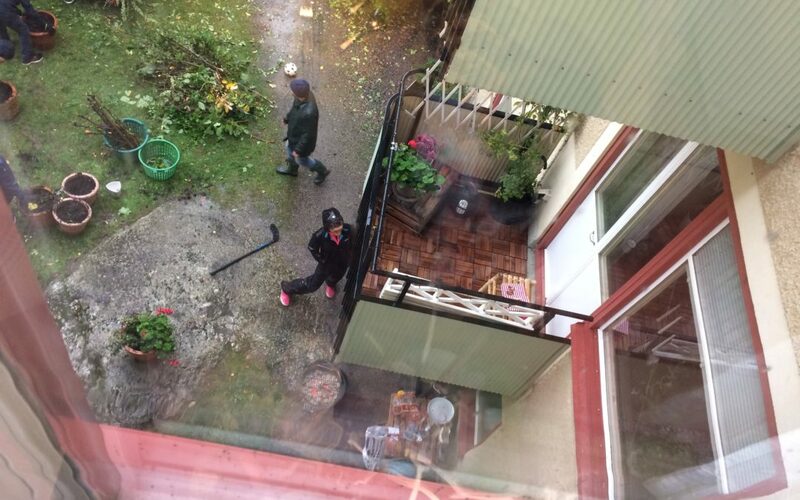 Last Saturday, the biannual event of communal cleaning at my BRF (Bostadsrättsförening) took place. If you don’t already own a flat in Sweden, you are probably not familiar with the fact, that in fact, you cannot own a flat a Sweden. Technically speaking, you own two things, the right to live in this flat, and a part of the building(s) belonging to your BRF, being proportionate to the size of your flat in comparison to the whole. With this comes not a communal spirit (not) but also the obligation to take care of communal areas. Of course, everyone pays a monthly fee which goes to repair work, clearance of snow, repair of washing machines, but in terms of outdoor spaces, a joint effort of all residents is required. 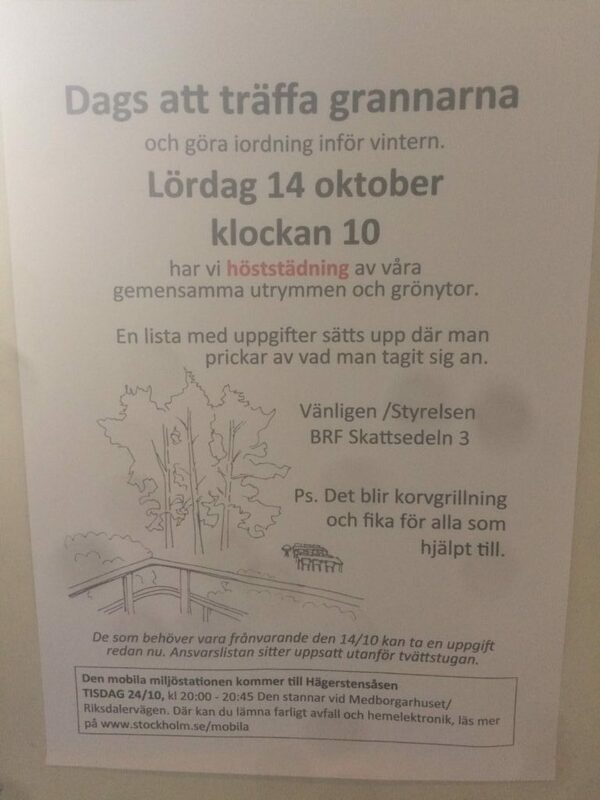 Traditionally this takes place in October (höststädning) and April (vårstädning), and the event is announced through a piece of paper (en lapp) stuck to the front doors three weeks in advance. All residents then spend those three weeks coming up with a good excuse for not attending, or scheming a way of leaving the building unnoticed. The same used to apply to myself and my husband, based on the premise that 10.00 am on a Saturday is far too early for any human being to take part in any physical labour. We would not even had had breakfast at that point! Now, with our children around, 10.00 am on a Saturday is ridiculously late, and conflicts with our lunch hour, and afternoon fika! But the kids make the whole thing more difficult to avoid. Although I am lazy and individualist, I do not want to pass that on to my offspring, so despite a delayed lunch, we do attend. Our BRF has a history of poor leadership and low attendance when it comes to this event. Different strategies have been applied in order to counteract this, although none have proved particularly successful. Moving the whole event from a weekend to a Tuesday evening at 6 pm (dinner time!) hit rock bottom, but not far was the year when they recruited the local dictator to assign tasks. More democratic approaches have been attempted since, a method which lasted a few years. This spring, however, the point of consensus was openly questioned by a couple of Austrians who were brave enough to speak openly about people just pretending to be doing work, as no single person actually knew what was to be done, and everyone was scared of getting it wrong. So thanks to the Austrians (who did not show up this time), this most recent event, taking place last week, was very well structured. The invitation clearly stated that everyone needed to sign up for tasks listed on a piece of paper (ansvarslista – list of responsibilities) posted on the door to the tvättstuga. Neighbours who were unable to attend the actual event were invited to assign themselves - and complete - tasks in advance. This was followed by a series of rather threatening letters (arga lappar), with the same message, appearing in our post box the following weeks. As the big day came, the list was still empty, and although we appeared in the garden (to which the ansvarslista had been relocated) 45 minutes late, no pen had touched that paper (silent rebellion). My husband and picked raking leaves right away, only to discover this - well at least all the rakes - had already been taken. So we went for weeding. We spent 30 minutes on this, arguing about what plants would qualify as weed (pretty much everything, according to my husband) and not (pretty much anything, according to me). This was as unproductive as not doing anything at all, so we swapped to scraping moss off tiles. This went well, until the inventory of vegetarians (for the BBQ) began, now using a different list. In order to reward participants, the BRF had invested in 10 kgs of hot dogs, rolls, mustard, ketchup and some saft, meaning an opportunity to network mid-through labour. We declined (blaming the kids) and soon retired to our flat (blaming the kids) and watched the whole event from our kitchen window). See photographic evidence above.